Skin cancer is the most common cancer in the United States and finding spots that could be cancerous is as simple as looking at your skin. A – Asymmetry: One half of the spot is unlike the other half. B – Border: The spot has an irregular, scalloped or poorly defined border. C – Color: The spot has varying colors from one area to the next, such as shades of tan, brown, or black, or with areas of white, red, or blue. D – Diameter: Melanomas are usually greater than 6mm, or about the size of a pencil eraser when they are diagnosed, but they can be smaller. E – Evolving: A mole or spot on your skin that looks different from the rest or is changing in size, shape, or color. Raise the arms and examine the right and left sides of the body. Then bend your elbows and look carefully at your forearms, upper underarms. Next, examine the back of your legs, spaces between your toes and your soles. Then, examine those hard‐to see areas like your back, buttocks and the top ofyour head. Use a mirror to inspect the back of your neck and scalp, parting your hair for a better view. Lift, Contour, and Rejuvenate at our monthlong Radiesse® & Xeomin® Spring Special. Throughout the month of April, get $50 off your first syringe of RADIESSE® Volumizing Filler and $75 off the second (regularly $890 each) or get 40 units of XEOMIN® for $390 (a $130 savings) or 20% off your entire XEOMIN treatment (if less than 40 units) and 10% off all Juvenus MD products! Space is limited so call 941-926-7546 to reserve your spot today! RADIESSE® Volumizing Filler is a dermal fillers that is FDA-approved to smooth moderate-to-severe facial wrinkles and folds, such as nasolabial folds. RADIESSE is also used to correct volume loss in the back of the hands. XEOMIN® (incobotulinumtoxinA) is a prescription medicine that is injected into muscles and clinically proven to temporarily improve the look of moderate to severe frown lines between the eyebrows (glabellar lines) in adults. Leading medical and cosmetic dermatology practice is set to complete a 3,000 sq. ft. expansion. This March, O’Donoghue Dermatology will conclude the second phase of a major expansion which began in the summer of 2013 with the addition of a phototherapy room, 2 new patient rooms, an on-premise sterilization lab, a new physician assistant office, and a larger reception area where they host educational seminars which are open to the public. 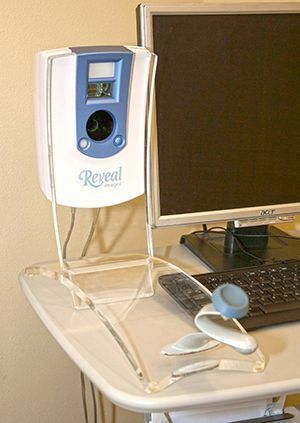 The Field Road office, which doubled its original footprint in 2013, will now offer a relaxation room for patients undergoing Mohs surgery, a laser operating suite, and an aesthetician suite where they will offer AquaGold® microchannel technology, Aqua Peels, Reveal® Imager 3D skin analysis, Zerona® laser body sculpting, Blue Light Photodynamic Therapy, and GentleWaves® LED skin remodeling. “This latest expansion is part of our ongoing commitment to offering our patients the most advanced treatment options available in the most comfortable environment possible”, said Dr. J. Morgan O’Donoghue. In addition to the physical expansions, the practice, which started out with just one Physician Assistant and a receptionist, now employs 8 staff members and 3 Physician Assistants. The Herald-Tribune Media Group's Living Well - a Health and Wellness Expo on Saturday, October 13, 2018 at the Venice Community Center. The O’Donoghue Dermatology team enjoyed giving away sunscreen samples and skin cancer information, as well as performing free skin screenings and 3D Digital Skin Analysis with the Reveal® Imager, which helps uncover damage below the surface of the skin, for anyone in attendance at the expo. O’Donoghue Dermatology just broke ground on the second phase of a major expansion. The expansion began in the summer of 2013 with the addition of a phototherapy room, 2 new patient rooms, an on-premise sterilization lab, a new physician assistant office, and a larger reception area where they can host educational seminars which are open to the public. The Field Road office doubled its footprint in 2013 and is now poised to add another 3,000 sq. ft. The current expansion, which is scheduled for completion on February 1, 2019, will bring with it a relaxation room for patients undergoing Mohs surgery, a laser operating suite, and an aesthetician suite where they will offer AquaGold® microchannel technology, Aqua Peels, Reveal® Imager 3D skin analysis, Zerona® laser body sculpting, Blue Light Photodynamic Therapy, and GentleWaves® LED skin remodeling. Tuesday, October 2 from 8:00 am to 4:00 pm Buy 1 syringe and get the 2nd at 1/2 price or buy 2 syringes and get the 3rd or 30 units of Xeomin® / Botox® Free plus 10% off all Juvenus MD products! For more discounts, sign up for Brilliant Distinctions® at www.BrilliantDistinctionsProgram.com and earn points for receiving treatments and purchasing participating portfolio products. You'll get special offers and promotions just for being a member! Injectable fillers are an affordable, non-invasive alternative to cosmetic surgery that can bring immediate results with little pain, swelling, or bruising. Fillers can be used to reduce fine lines and wrinkles or to fill scars and uneven areas of the face or they can also be used to add volume to thin lips, restore fullness to your cheeks or add definition to your jawline. Did you know that just one bad sunburn can double your chances of developing melanoma later in life? O'Donoghue Dermatology will be offering Free SPOTme® Skin Cancer Screenings * on the following Fridays: August 31, September 7, and September 14, from 8:00 AM to 12:00 PM. If it's been a while since your annual skin examination, stop by or, better yet, call 941-926-7546 to schedule an appointment and reduce your possible wait time! * This is a rapid screening for skin cancer and should not replace or be a substitute for a yearly examination with your physician or dermatologist. For more information about what to expect from your SPOTme® Skin Cancer Screening, visit: https://www.aad.org/public/spot-skin-cancer/programs/screenings/what-to-expect-at-a-screening. O'Donoghue Dermatology now offers Ultratherapy®, the only FDA-cleared, non-invasive procedure that lifts and tightens the neck, chin and brow, and improves lines and wrinkles on the chest. Take a peek at what your results could look like with this Simulation Tool then call 941-926-7546 to schedule your appointment! In addition to increasing your risk of skin cancer, including squamous cell carcinoma, melanoma, and basal cell carcinoma, sun exposure causes most of the skin changes we think of as "normal aging". Ultraviolet light damages the elastin fibers in the skin, causing it to sag, stretch, and lose the ability to come back after stretching. It also causes the skin to bruise and tear more easily and take longer to heal. Broad Spectrum Sunscreens can protect you from further skin damage, but what can you do about the damage that’s already done? The Skincare Boutique at O’Donoghue Dermatology now carries the only sunblock that protects AND repairs with an enzyme that actually “gobbles up” sun damage. 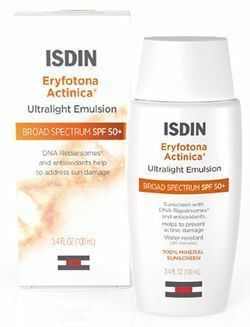 Eryfotona Actinica® by ISDIN addresses existing actinic damage (damage caused by light) with DNA Repairsomes® and antioxidants, and it helps prevent additional sun damage with 11% zinc oxide. We are proud to announce Dr. J. Morgan O’Donoghue’s inclusion in Sarasota Magazine’s prestigious Top Doctors issue for 2018. The top-notch medical care available on the Suncoast is one of the top reasons people are drawn to our area so it is particularly meaningful to be among the best in such a competitive market. Doctors included in this list are nominated by their peers, then a select panel evaluates the nominee’s credentials and career histories including their education, board certifications, procedure volumes, and outcomes. Doctors cannot nominate themselves and they cannot pay to be included in this list. Book your appointment (and his) for our Botox® / Xeomin® Event on Thursday, June 21 from 8:00 a.m. to 4:00 p.m. and get 10 units FREE (a $130 value) when you buy 30 or get 20% off your entire treatment + 10% off all Juvenus MD products & all fathers who bring their special someone with them, get a $50 Gift Card towards their next treatment so make it a date! Give all the special moms in your life the gift of healthy, beautiful skin with protective clothing, healthy cosmetics & other skin care products from top manufacturers like Coolibar, Jane Iredale & JuvenusMD available at the O'Donoghue Dermatology Skincare Boutique or, better yet, pick up a Gift Card (in any amount) and let her choose from a broad range of cosmetic products or procedures! The Skincare Boutique at O'Donoghue Dermatology is open Monday thru Thursday from 8:00 to 4:00 & Fridays from 8:00 to 12:00. 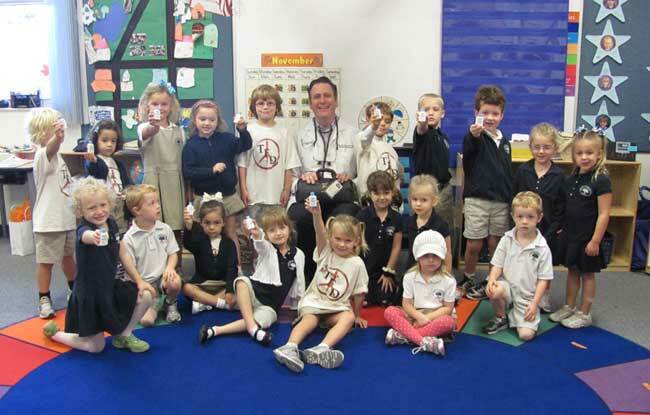 Ever wonder what a Physician Assistant does? Along with Doctors & Nurse Practitioners, Physician Assistants or PAs are primary care providers. They can examine, diagnose, treat, prescribe, interpret lab results, and even assist in surgeries. Physician Assistants complete 2,000 hours of clinical rotation before becoming nationally certified & state licensed, and another 100 hours every 2 years in order to maintain those credentials. PAs are an essential part of our practice & healthcare in general. 50 years of combined expertise ready to serve your skincare needs! for more about the role of Physician Assistants in healthcare. Don't miss our next Botox® / Xeomin® Event! Buy 30 units and get 10 units FREE ($130 value) or get 20% off your entire treatment plus 10% off all Juvenus MD products, and receive a $50 gift certificate towards your next treatment if you bring a friend who is new to our practice! 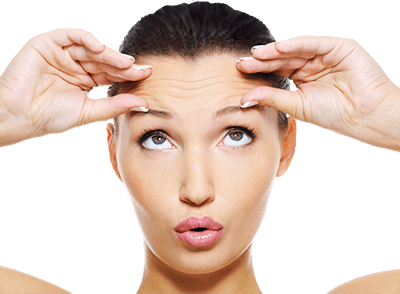 Wrinkle treatments are injected into the muscles in order to relax them and improve the look of wrinkles and frown lines between the eyebrows, across the forehead, and around the eyes and mouth. The procedure is quick, painless and with no downtime. The results are visible in 3 to 5 days and last up to 4 months. After repeated treatments, the results can last 6 months or longer. 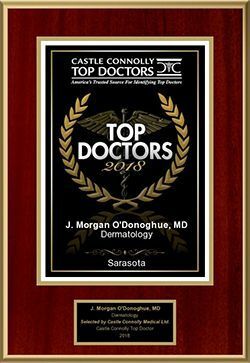 Castle Connolly Medical, publisher of the most trusted listing of Top Doctors® in the nation, has just selected Sarasota Dermatologist, Dr. J. Morgan O'Donoghue, as one of the Top Doctors in the Sarasota, FL area for 2018. Castle Connolly Top Doctors® must be nominated by fellow board-certified MDs and DOs. Of the tens of thousands of nominations the company receives each year, only a small percentage is ultimately chosen for inclusion in the list. Castle Connolly’s physician-led research team narrows down the nominee’s based on their medical education, training, hospital appointments, disciplinary histories, and more. “This recognition is especially meaningful because you are nominated by your peers and it also comes as we continue to celebrate my 18th year in practice”, said Dr. O’Donoghue. Castle Connolly Medical identifies top doctors across the United States then provides consumers with detailed information about their education, training, and special expertise in their printed guides, online directories, and through partnerships with over 50 city and regional magazines and major newspapers. Doctors do not and cannot pay to be selected as a Castle Connolly Top Doctor. Castle Connolly's President and CEO, Dr. John Connolly, had this to say about Dr. O'Donoghue's recognition, "Only a small percent of physicians are selected to be Castle Connolly Top Doctors®. Dr. O'Donoghue was nominated by physician peers and selected by our physician-led research team at Castle Connolly Medical Ltd. Selection is an impressive accomplishment worthy of recognition. My congratulations to Dr. O'Donoghue." We're proud to announce the addition of Lorie Masters, MCMS, PA-C to the O'Donoghue Dermatology team. Lorie comes to us with over 18 years of experience in medical, surgical, and cosmetic dermatology. Add that to Amy's 15 and Dr. O'Donoghue's 18 years of dermatological experience and you get over 50 years of combined expertise ready to serve all of your skincare needs! 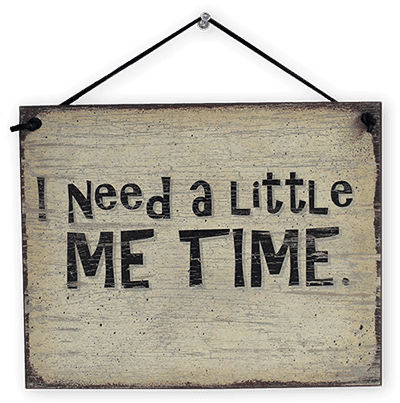 If the stress of the holidays left you with a few more frown lines & wrinkles, schedule some "ME TIME" on Wednesday, January 31st from 8:00 to 4:00. Buy 30 units and get 10 units FREE or get 20% off your entire treatment, plus 10% off all Juvenus MD products, and receive a $50 gift certificate towards your next treatment, if you bring a friend who is new to our practice! Wrinkle treatments are injected directly into the muscles in order to relax them and improve the look of wrinkles and frown lines between the eyebrows, across the forehead, and around the eyes and mouth. The procedure is quick, painless and with no downtime. The results are visible in 3 to 5 days and last up to 4 months. After repeated treatments, the results can last 6 months or longer. Get 30% off your entire filler treatment, plus 10% off all Juvenus MD products, and receive a $50 gift certificate towards your next treatment, if you bring a friend who is new to our practice! A non-refundable $150 down payment is required to book your appointment. Injectable fillers are an affordable, non-invasive alternative to cosmetic surgery that can bring immediate results with little pain, swelling, or bruising. Fillers can be used to reduce fine lines and wrinkles or to fill scars and uneven areas of the face or they can also be used to add volume to thin lips, restore fullness to your cheeks or add definition to your jaw line. Since Dr. J. Morgan O’Donoghue opened the medical and cosmetic dermatology practice at 1952 Field Road in Sarasota in 2007, O’Donoghue Dermatology has more than doubled in size, with a physical expansion in 2013 and the addition of several medical and support personnel. Further expansion is planned. The practice, which started with a physician assistant and a receptionist, now employs seven staff members and two physician assistants and a third PA is being hired. 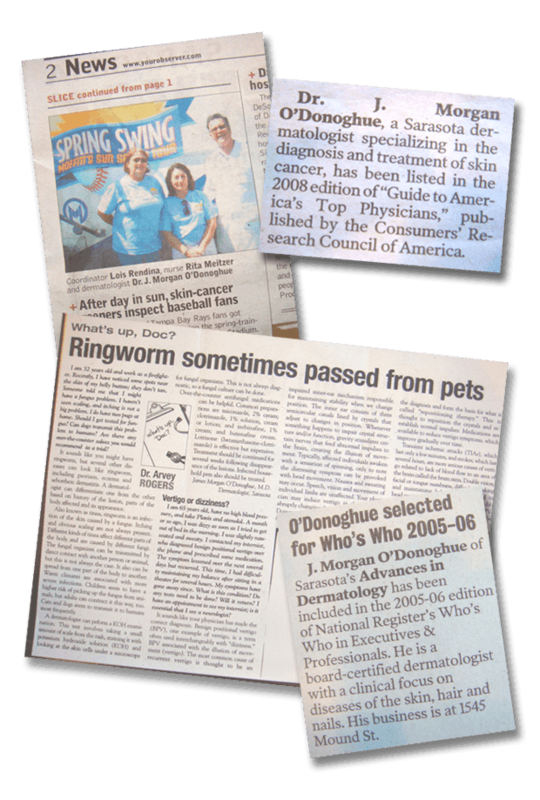 O’Donoghue has been in private practice for 17 years. 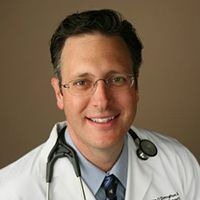 He is certified by the American Board of Dermatology, is a fellow of the American Academy of Dermatology and past president, board member and fellow of the Florida Society of Dermatologic Surgeons. BOTOX works by inhibiting the release of neurotransmitters, a naturally occurring protein that is released from our nerves and activates our muscles. Individuals have differing amounts of neurotransmitter receptors in their muscles, so each person will see a slightly quicker or slower response to BOTOX. Most patients will respond within 72 hours of a treatment, but it can take up to a week for the effects to be noticeable. Typically, the best response is reached around 10 days after administration and last about 3 months, but it can last up to four months. Ever wonder why BOTOX® doesn't work for some?